This is a Seagate FreeAgent Go external hard drive. It is so thin and small and easy to carry around. I bought a 250GB one. (I think the flash drive above was like 3GB.) Well it had plenty of room to hold all the files I needed it to plus TONS of room for more! It is a silver/gray color so my husband started referring to it as “Gray Guy.” Then at some point during the year, the other teacher’s external hard drive crashed. She lost everything. She even took it to an FBI crime lab to try and retrieve her data! She was devastated! She had spent hour scanning in pages from teacher resource books and collecting things. She of course copied back her files that I had, but she lost everything new she added since I originally copied her files. Well, that freaked me out! I didn’t want to lose all of my files! So I bought a second external hard drive. That’s just the folders. I have tons of files I didn’t show that aren’t in a folder yet. One of the things I want to do this summer is clean this out and get rid of stuff I no longer use/need and reorganize my folders. When I find things on the Internet I like or I buy something from TPT and don’t have the Pink Lady plugged in at that time, I have a folder on my desktop that I add things to so I can add them to my Pink Lady later. (That folder is pretty full right now. I need to add stuff to the correct folders! So that’s how I save all of my “stuff.” I love it because I have everything with me all the time! My sister is starting college this fall, and one of her graduation gifts from me was a “Blue Girl” (Blue external hard drive)! How do you back up your data or organize your files? Check out the linky party for more ideas or share your own! What would we do without technology?! Thanks for linking up! Curious- how much do those guys cost? I’ve got a flash drive but I’d love to have more storage space! I am so glad you shared this. 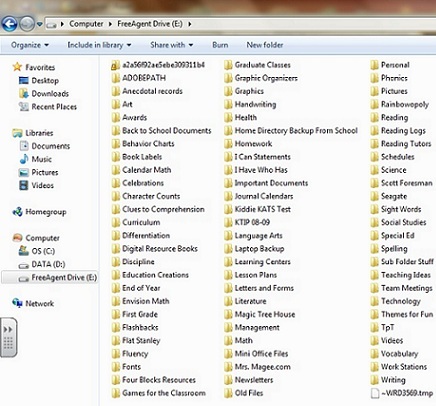 I have a grey guy that I use to back up my laptop incase it crashes, but I never thought of putting my teacher files on there and taking it back and forth to school. Thanks so much. People keep telling me to get an external hard drive! Maybe now I will. 🙂 Thanks for the info!! 1TB is HUGE! My teacher friend has a 1TB one. You could add stuff every day until you die and still have room left over! lol!! My external Hard Drive recently crashed. I was pretty sad! I wasn’t able to get anything back, but I bought another one. I still love them and working on rebuilding my files! I too have Seagate and LOVE it!